What Are the Causes of Lower Intestinal Bloating After Drinking Alcohol? No matter how much you might want to have a drink, should think twice and avoid it if drinking alcohol causes consistent bloating in your lower abdomen. Bloating is the result of increased gas that forms in your digestive system and becomes trapped, building pressure in your stomach. Bloating is commonly the result of swallowing air or difficulty digesting certain portions of foods. Make an appointment with your doctor to determine the cause of your symptoms. It may be that you're intolerant to one or more of the ingredients in the alcoholic beverage. Common intolerances that relate to consuming alcohol are histamine, alcohol and certain grains. If your digestive system cannot fully digest one or more of the ingredients in the beverage, harmless bacteria will interact with the undigested portion of the beverage and create gas. Any gas that does not get expelled from the body through passing gas or belching will remain in the digestive system and cause your lower abdomen to swell. Keep a record of what alcoholic beverages cause these symptoms to occur. If you have irritable bowel syndrome, you may develop excessive bloating after consuming alcohol. Certain foods and beverages, such as alcohol, caffeine and dairy products, may trigger IBS symptoms, according to the National Digestive Diseases Information Clearinghouse. IBS affects about 20 percent of the American population and typically leads to stomach pain, chronic diarrhea or constipation. The exact cause of this condition is still not fully understood and it is commonly treated with dietary modifications and stress reduction. In severe cases prescription drugs may be recommended. Some types of alcohol might cause problems if you suffer from celiac disease. This digestive disease is an auto-immune disorder that causes the immune system to attack the lining of the intestines when you consume gluten, according to PubMed Health. Gluten is a common protein found in various grains, such as wheat, rye and barely -- the grains used to make several types of liquor. 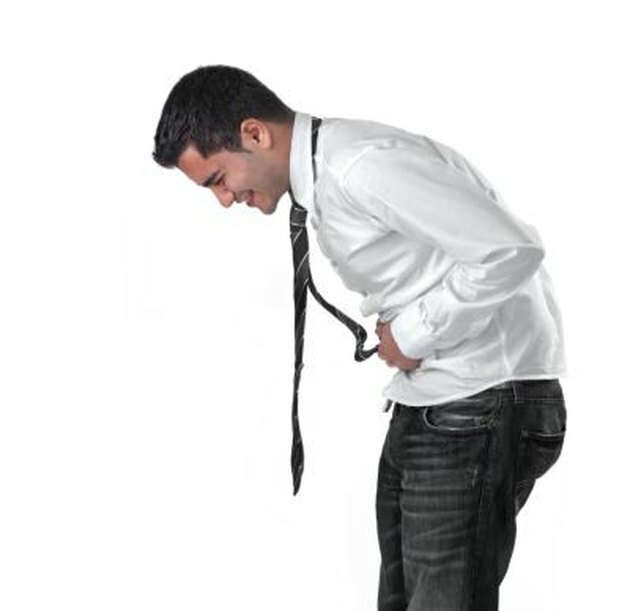 If you notice signs of celiac disease -- such as abdominal pain, diarrhea or blood in your stool -- seek medical attention. Alcohol is an irritant and may cause pain and bloating for various reasons. Other considerations may include cancer, peptic ulcers and Crohn's disease. Only your health care provider can diagnose your condition. Do not attempt to treat your symptoms without first consulting your doctor. University of Notre Dame: Alcohol Allergies -- Do They Exist?